Everyone sees the destruction caused by a natural disaster – the loss of life and property make headlines for weeks. But natural disasters can have lasting effects that don’t garner as much media attention. Beyond property and infrastructure costs, disasters impact the health of the business community. According to the Small Business Administration, as much as 25 percent of small businesses do not reopen after major disasters. Communities need to be prepared for all of the effects of a natural disaster, and there is a new tool available to help them be more resilient. 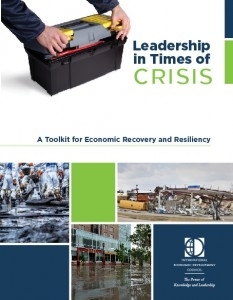 The International Economic Development Council (IEDC) recently launched "Leadership in Times of Crisis: A Toolkit for Economic Recovery and Resiliency" – a guide to help communities recover their economy after a disaster. The toolkit was funded in part by an Economic Development Administration (EDA) grant and is available for free download at www.RestoreYourEconomy.org. It includes practical resources, proven how-to's, real world case examples, checklists and best practices to implement recovery programs following any type of disaster and to make preparations in order to be more resilient after potential future events. Environmental sustainability is a priority for the Department of Commerce and EDA. In the last 5 years alone, EDA has made more than 130 investments that support green projects and environmental resilience across the nation. As climate change becomes more pronounced, it is crucial that communities and regions factor in to their strategic plans new development and infrastructure to account for and mitigate the potential environmental impact. 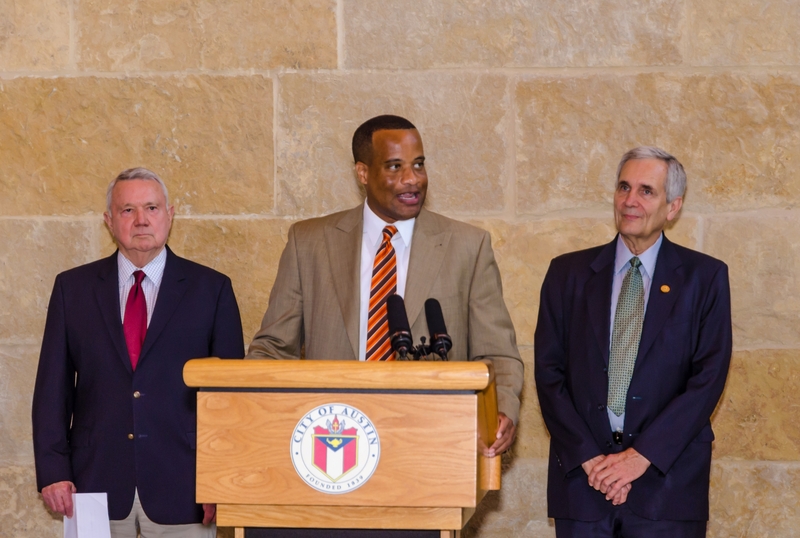 Earlier this month, I had the honor of being joined by Congressman Lloyd Doggett and Austin Mayor Lee Leffingwell in Austin, Texas to announce an EDA grant to the city. EDA is investing $1 million to build infrastructure to serve Austin’s [re]Manufacturing Hub Eco-Industrial Park, which will house recycling manufacturing firms and focus on recycling market development. This grant checks some critical boxes by creating jobs and securing private investment. Julie Lenzer was recently appointed by U.S. Secretary of Commerce Penny Pritzker to lead the Office of Innovation and Entrepreneurship (OIE), an office within the Commerce Department’s Economic Development Administration (EDA). In her capacity as Director of the OIE, she is charged with driving programs and policies that support innovative economic development such as innovation-based entrepreneurship and regional innovation clusters. Her passion is infusing innovation and entrepreneurial mindset coupled with action into individuals, communities, and regions to act as a catalyst for economic growth. Formerly, she was the Executive Director of the Maryland Center for Entrepreneurship (MCE) which is an initiative of the Howard County Economic Development Authority. Based in Columbia, Maryland the MCE is focused on igniting the entrepreneurial culture and bringing together the entrepreneurial ecosystem across the state. During her tenure, the MCE quadrupled its client base and saw the creation of new programs such as 3D Maryland, a leadership initiative connecting resources in additive manufacturing; the Conscious Venture Lab, an accelerator focused on Conscious Capitalism; and a technology transfer accelerator in partnership with Johns Hopkins Advanced Physics Lab and other leading research institutions. Even if you’ve never heard of Greenville, South Carolina the chances are that if you own a car, what is happening there has affected you. Greenville is home to the Clemson University International Center for Automotive Research (CU-ICAR). The ground-breaking automotive research taking place at CU-ICAR is only part of the story. Greenville, like much of the region, used to be a textile town. The decline of the textile sector hit Greenville hard. What could have spelled disaster for this charming southern town was instead treated as an opportunity. The local leaders brought together the university and other public and private partners to create what has since become a thriving automotive cluster. BMW located a plant in nearby Spartanburg, and Clemson seized an opportunity to get involved in growing the region’s automotive sector. Over our careers as entrepreneurs, CEOs, consultants, business advisors and now as investors, two things have become pretty apparent to us: first, capitalism offers society the best hope of making life better for people all over the planet. This basic premise cannot be ignored in the face of overwhelming historical evidence. And second, although many don’t like to admit it, capitalism is in a state of crisis. Look around, and you will find far too many examples of companies that seem to have lost their way. Capitalism as currently practiced still contains many hard edges that prevent it from being as powerful a force for good as it could be. Much of the nation doesn’t trust Corporate America. In light of persistent examples of poor customer service, full time employees taxing our social services because they can’t provide for their families, the financial crisis, the recent recession, and persistently low levels of commitment and engagement in the American workplace, many of us see businesses’ focus on short-term profits at any cost as a major contributor to this state of affairs. EDA has issued a call for applications for membership on the National Advisory Council on Innovation and Entrepreneurship (NACIE) – a federal advisory committee that will advise the Secretary of Commerce on issues related to accelerating innovation and expanding entrepreneurship, with an added focus on job-driven skills training that creates jobs and spurs innovation. The Commerce Department is now accepting applications for new Council members through July 14, 2014.